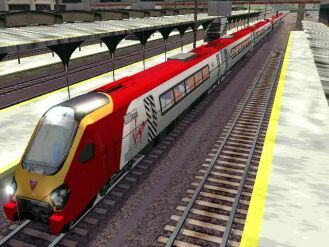 Here are some parameters for you to change in the ENGine files of David Babb's Virgin Trains Voyager DEMU trainset voyager.zip (7.1Mb, 15-Jun-02) from the Train-sim.com library. Each car in a Voyager 4-car or 8-car set is powered by a Cummins QSK19 diesel, rated at 560kW/750hp and incorporating CELECT electronic engine management. 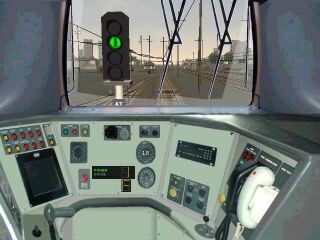 Electricity is supplied to two electric motors, each of which drives the inner axle on each bogie. Each electric motor is rated at 235kW/315hp. Thus the MaxPower parameter has been set to 630hp for each ENGine file. Since the Cummins also supplies auxiliary power for air-conditioning, lighting, and so on, a value of 630hp seems a better value to use for MaxPower rather than 750hp. You need to work through each ENG file - there are 3: Voyager.eng, VoyagerCoach.eng and VoyagerCoach2.eng in the Voyager sub-folder under the Trainset folder. Although the Voyager Classes 220/221 site has a lot of information, there's no value for the mass of each Voyager car.